Last month Muki Haklay published an interesting blog post on a digital divide in OpenStreetMap data. The basic conclusion is that more affluent areas are mapped more completely that poorer areas. Perhaps even more worryingly, the data reveal that the gap in virtual representation between affluent and deprived areas is actually growing. These results mirror my own findings on other types of user-generated content that represents place. I’ve found that both Wikipedia and Google display similar patterns. 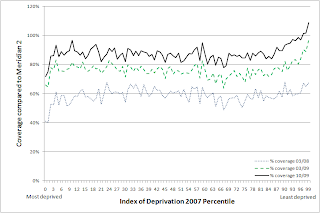 Following Muki, the next step will be to use measures of affluence and deprivation (GDP, levels of internet access etc.) to more precisely examine the specific relationships. Using data collected from a script that searches Google for keywords in user-generated kml files, I recently made a series of maps representing the geographies of four religious keywords (“Allah,” “Buddha,” “Hindu” and “Jesus”). In every case unique patterns emerge. As might be expected, the word “Hindu” is far more likely to appear in online representations of place tagged to the Indian Subcontinent than anywhere else in the world. References to “Allah” are similarly clustered in much of the Islamic world. The “Hindu” and “Allah” maps can be seen below, and the full set can be accessed over at the floatingsheep blog. The interview with Nora Young on CBC’s Spark can be accessed at the following link. It begins at 35:20 and lasts for around six minutes. In the interview I discuss some of the uneven geographies of Wikipedia. According to the Twitter blog, the micro-blogging service will soon allow users to add lattitude and longitude to any tweet. This development will provide people with the ability to map and measure the movement and intensity of trends, thoughts, and ideas in both real-time and real-place. Exciting possibilities. As soon as the service goes live, expect analysis both here and at the floatingsheep blog. I am the Professor of Internet Geography at the Oxford Internet Institute, a Turing Fellow at the Alan Turing Institute, and a Research Affiliate at the University of Oxford’s School of Geography and the Environment.